The great body of scientific knowledge is facing a crisis unlike any before. With a discrepancy now raised by a number of scientists relating to the speed of light, there are shock waves reverberating around the scientific fraternity. The dawning of a new epoch of science is pending that will introduce what was previously thought to be impossible: namely the exceeding of the speed of light. The calculated speed of light is the psychological barrier that still exists between modern physicists and Einstein’s theory of relativity. Its precepts are now unworkable in terms of present scientific consciousness and the quantum theories that appear to contradict this holy grail of relativity thinking. Some individual scientists know that, at the extremity of their theoretical calculations, only the invention of abstract particles can substantiate their findings. To their astonishment, the particles intuited are then discovered to exist! It’s the presence of these abstract particles on the periphery of existence that challenge the accepted laws of physics. In a recent experiment at CERN, the world’s largest particle accelerator, scientists were baffled when neutrino sub-atomic particles seemed to exceed the speed of light. 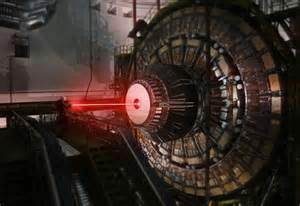 What happened was that the neutrino particles fired into the tunnel at CERN did exceed the speed of light and immediately instigated a time change. Liberated from the past, the particles entered the immediacy of the present with no positional bias to subject them to the laws of cause and effect. The particles had transcended time – and then reappeared to contradict the minds of the scientist still limited to rational sub light speed intelligence. It was only after the experiment that some scientists began to question the validity of what had happened. The material composition of human beings makes it impossible for us as a race to exceed light speed and externally travel to the stars. The constituent parts of our physical bodies contain the elemental particles of the earth’s primordial past, and limit our exploration of the cosmos to the restrictions of a space suit and sterile environment of a spacecraft. Exposure to pure energy at the sub-atomic level would disintegrate the body. Even a state of suspended animation would destroy the brain cells and render the individual brain dead. This is why in the future it will be intelligent robots or cyborgs that will make the journey into the extremities of outer space. However, what makes it possible to exceed light speed is the cosmic dimension of human beings. There are two aspects of reality that are inherent within the human spiritual system; both operate beyond the speed of light. The first aspect is life itself: the sustaining vitality within the form. The second aspect is consciousness: the power of intelligence that supports the sensory awareness and functionality of the mind. Both life and consciousness are implicit in every moment of the living experience. The tragedy is that, for most people, the perfection of earth existence is the brief period as a baby and the last moments before physical death, when life and consciousness function as a harmony of spiritual unity. Consciousness never moves in its unwavering state of silence beyond the limitations of relativity thinking. The mind has no way of knowing the reality of consciousness and can only approach its mystery in stillness and humility to a source of power greater than its self. The dilemma facing the scientist who has entered this state is how to rationalise something so intimate but cannot be quantified as a formula or theory. Theories have built-in obsolescence that enables them to be modified or superseded by each new generation. They represent the unsteady condition of human intelligence that arises as a consequence of the lack of real authority in man through his failure to love, and in woman as her self-doubt and absorption of the male sexual self. Reality or truth, on the other hand, remains untarnished but can become corrupted when conceptualised by the mind. Examples of this are the truths imparted by Jesus Christ and Buddha; over the millennia countless generations have interpreted their words and distorted the simplicity of their teachings. The fundamental difference between the mystic and the scientist is the direction or focus of intelligence. The mystic looks inwards and, by undergoing a process of negation, detaches from existence through surrender to the love of the unknowable. The scientist looks into the objective world and becomes attached to existence through the desire to understand and manipulate matter. It’s this intellectual bias, creating opposition and conflict, which ultimately sullies many of science’s most brilliant ideas. However, the breakthrough must come; but it will be through default and not as liberation of inspirational knowledge for the benefit of mankind. Science will hail the breakthrough as the most incredible scientific achievement ever. A source of energy will be discovered (beyond light speed) that produces particles imbued with the creative intensity of a star. It will open up the next phase of human evolution, with space travel to the other planets and then the stars. The flaw in this will be that this wonder of science will be an objective force that is an external agency and not the state of consciousness within the individual. As a consequence of this, just as nuclear power is used for the proliferation of atomic bombs as well as an efficient energy source, the new energy will produce similar negative effects for the wellbeing and spiritual advancement of the race. The individual scientist may weep at the futility of his efforts to deter the political and military powers from utilising the latest technology for weapons and tactical superiority. The progressive movement is an unstoppable wave of the past that must repeat itself in accordance with the law of karma. Such is the ignorance of the world that science and technology, as an unconscious impulse, must provide an ever swifter medium to communicate the misery and unhappiness of humanity.